Motorcycle hire in Phuket is by far the cheapest way to explore the Island. The motorcycles for hire range from 125cc bikes to 750cc, they are cheap to hire and cheap to run. Prices for the motorbikes will vary depending on where you rent the motorcycle from and what season it is. The longer you hire the motorcycle for the cheaper it gets, on average they will cost between 150 baht to 300 baht per day. Personally I prefer and feel much safer hiring a car to get around the island, they are not only much safer they are also more comfortable than riding a bike. However over recent years my other half has decided that when we are not traveling with the kids, he thinks it’s much easier and cheaper to hire a motorbike. Now if he wasn’t an experienced rider, there would be no way you would see me on the back of a motorbike in Phuket, or anywhere else for that matter. Phuket is definitely not the place to learn how to ride a motorbike. The Island of Phuket is among Thailand's top five provinces in terms of the number of road injuries and deaths each year. Ensure that you hold a current motorbike license in your home country as well as an international drivers license and always wear a helmet. 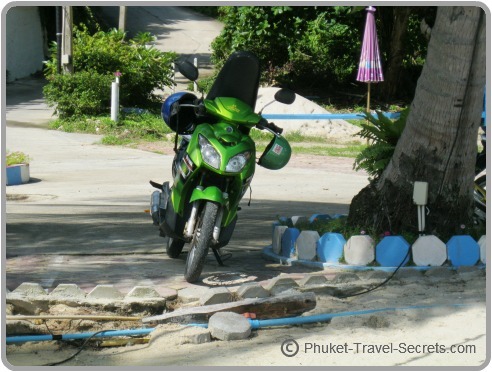 Before you leave home check that your travel insurance covers you if you have a motorbike accident whilst you are in Phuket, as some insurance policies will not cover you if you have an accident using a vehicle you are not licensed to drive. If you really must hire a motorcycle in Phuket just be aware that insurance is not usually included, except for third party insurance for personal injury costs up to 50,000 baht. This insurance does not cover damage to other vehicles, or the bike you hired or yourself. When hiring a motorcycle you may be asked to leave your passport with the rental shop, I would only give them a photocopy of your passport, never the original. If they insist on holding your passport move on to the next operator. Another way of getting around Phuket on a motorcycle without having to hire one is to catch a motorbike taxi. Again they are not the safest way of getting around Phuket, but handy for short trips and they are available day or night. You will find these motorcycle taxi's on street corners, the operators wear green or red vests. The price depends on the distance and your bartering skills, prices start from 20 baht make sure that you agree on the price before getting on the bike and always wear a helmet. Motorcycle hire in Phuket and motorcyle taxi's maybe a cheap mode of transport for getting around the island, with many visitors opting for this mode of transport and many visitors wishing they hadn't.